I got a package of black beluga lentils a couple weeks ago and I have been dying to try it. Today was the day. 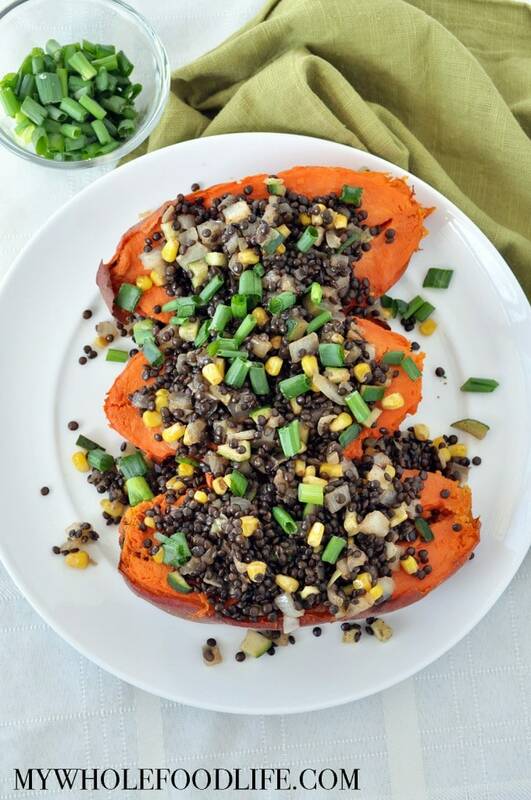 I made these Lentil Stuffed Sweet Potatoes and they were out of this world delicious. Super easy to make too. I cooked the sweet potatoes in my Instant Pot and it took no time at all. Since I know not everyone has an instant pot, I will write directions for the oven as well. If you like sweet potato recipes, you may also like my Sweet Potato Chili or my Sweet Potato Pasta with Brussels Sprouts. If you can’t find the black beluga lentils, you can also use black beans or brown lentils. Both should work well. This dish is not only easy, but also budget friendly. Vegan and gluten free too. I topped mine with some of my homemade dairy free sour cream and it was delicious! A super easy, budget friendly meal! Cook the beluga lentils using 1 1/4 cups uncooked lentils and 2 1/2 cups water. Bring water to a boil, then reduce heat, and let simmer for 15 minutes covered. Set aside. In a large saute pan , saute the onions, veggie broth, zucchini, corn, and garlic for 7-9 minutes on medium high heat until the onions are soft, reduce heat to low and add the cooked lentils and stir. If using an Instant Pot , fill the bottom with a little water, place the sweet potatoes on top of the trivet. Pierce with a fork a few times. Cook on manual for 20-25 minutes and then do a natural release. If using an oven, preheat to 400. Place the sweet potatoes on a lined baking sheet . Brush with oil and pierce with a fork a few times. Cook for about 45 minutes, OR until you can pierce the flesh easily with a knife. To serve, cut open the baked sweet potatoes. Pour the lentil mixture over them. Top with green onions, sea salt and dairy free sour cream. This should keep in the fridge for at least 5 days. Enjoy! I love that you have an Instant Pot. We have one too, but I find it hard to find new recipes for it. I would have never thought to cook sweet potatoes! Keep the recipes comin'! Yummy and telepathy as well. Was just pondering, how I put sweet potatoes into EVERYTHING and your new recipe appeared. Thank you, Melissa. Love my IPot. I steam a lot of different vegetables in it. You are so welcome! Love my IP. The black lentils are more earthy in taste. Kind of like brown or green lentils. The sweetness of the potato and corn pairs so well to balance out the flavors. Let me know what you think! This just looks so yummy!!! It's definitely going on my to make list!